A lot of this episode is trying to underline the conflict between Ryn and her sister Donna. It’s repetitive but comes down to Donna thinking all humans are bad and should die while Ryn is desperately insisting some humans are good - Ben & co specifically - and that they need the humans help since they’re all starving. Which Donna thinks of as siding with humans above her - mermaids seem to have a very black & white “me or them” mentality since Ryn plays this a lot. 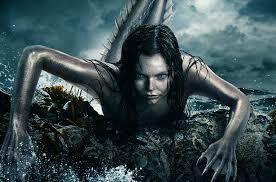 Through all this Helen, the ex-mermaid, insists they should return to the water. Has anyone even told her about the over-fishing? Ryn also continues to do weird human interaction things - being all touchy feely with Maddie and when Maddie kisses Ben and says she loves him, Ryn does the same much to Ben’s bemusement. Maddie laughs it off saying she got one of them… again this show was sold on the idea of “bisexual mermaids” to LGBTQ press but it feels a lot more like “mermaid with no idea of human boundaries”. Ben is working on that over-fishing thing with his dad and surprisingly isn’t shot down. The negative publicity his company is being singled out for isn’t helping and Ben actually has a viable business plan for increased profits and sustainable fishing (aimed at high end retailers) which means they can also spin good PR (with these terrible lax regulations we’re going above and beyond so great advertising). Surprisingly, since I thought he was going to be the worst - Ted does not seem to be just doing this to placate Ben but is taking it seriously. He also really likes Maddie and encourages Elaine to thaw towards her to try and keep Ben around more. It’s an odd turn around. For added drama, Chris recognises Decker and tells Xander who manages to be both a) a deeply foolish human being while b) being the only person with a working brain and figures out that Donna is actually a mermaid, confronts Decker about it and has his beliefs confirmed when he sees her change. With Decker around, Maddie and Ben do some research and find he’s been theorising about the existence of mermaids forever and being discounted before he suddenly disappeared when the navy hired him. Which is kind of weird - I mean is this standard navy operating procedure? Hello Amy, we’re hired you to be a file clerk on floor four documenting our paperclip usage. Now delete your social media and wait while remove all reference to you ever - you no longer exist. Welcome to the team! Despite this SOMEONE invites Decker to Elaine’s big swanky party where he drops the idea that mermaid stem cells can totally cure paralysis (obviously not specifying mermaids) and Ben is all smiley before dragging him aside and saying how very not cool it is to dangle miracle cures in front of his mother (I like that this is his first worry - his mother). And talks to him about siren song, realising Decker’s been hit by it. Ben described his own experience to Maddie - that it’s like a drug, calling you always in your head. It sounds more than a little overwhelming and you’d think the mermaids would use it more often. Or Helen would use it for repeat custom. But Ben realises this may be why Decker isn’t so gung ho with the Navy - and recognises Decker isn’t working with the navy or he certainly wouldn’t be here alone. In exchange for the chance to see Donna again, Decker explains the plan: starve out the mermaids then there’s a trawler off shore with Mermaid lures and lots of mermaid cages.